High efficiency T5 lighting controls individual circuits, saves energy, and increases light output. Insulation made of six-inch polyisocyanurate and Core-Fill 500 (TM) thermal aminoplast foam increases energy efficiency. Reflective Rooftop from Energy Star® has an 87.5% initial reflectivity. Skylights provide diffused & UV filtered sunlight to also save on energy costs. EnviroLift® and Aquavantage™ technology used compressed air and tap water instead of electrical motors and hydraulic oil. Using this technology, we are able to keep a total of 420 gallons of oil out of the ground! The Little Things Make a Big Difference! Low VOC paint designation offers long-term durability as well as reduced environmental impact. We are thinking ahead through utilization of pre-wired electric vehicle charging stations. On-site recycling ensures our daily actions are environmentally friendly. 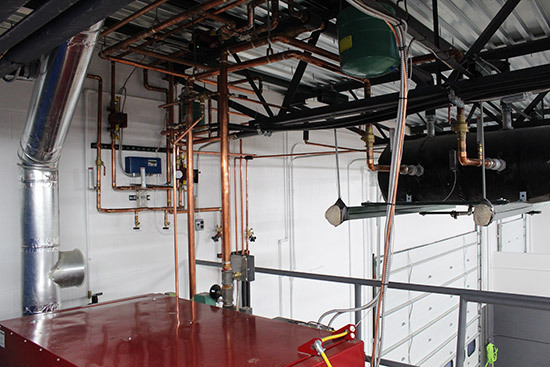 The RED “Clean Burn” boiler uses 100% re-purposed waste oil to heat the concrete slab flooring which heats our building. Part of our commitment as an environmentally conscious company is to serve our environmentally conscious customers – which is why we are proud to offer hybrid repair. Detroit, Oak Park, Franklin, Beverly Hills, Royal Oak, Birmingham, and Bloomfield drivers, we invite you to visit our Metro Detroit hybrid repair facility!